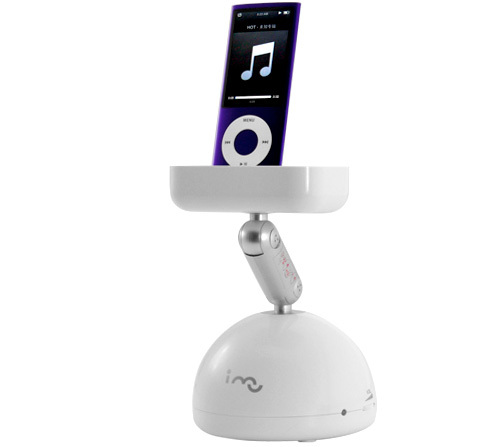 Resonance iPod Dock Is Vaguely Reminiscent Of Something | OhGizmo! I guess if you’re an iPod/iPhone accessory maker, the easiest way to make your product appeal to the Apple crowd is to basically rip-off the design of another Apple product. In this case it’s an iPod dock/speaker that looks like it was constructed from a discarded iMac of yesteryear. But in its defense, this particular dock does bring something relatively unique to the table. Instead of featuring a traditional speaker, it uses resonance to transmit the sound from your iPod, iPhone or anything you connect to the 3.5mm line-in jack, through a hard surface such as a wooden table, a marble floor or glass windows. The audio output is rated at 12W, though I have no idea how loud that translates to with a resonating object, but there’s a built-in amp as well which should help boost the intensity. The arm holding the actual dock does articulate if you were wondering, though at just a couple of inches in length I can’t see how that’s beneficial in any way. ~$42 available from Chinavasion.